Chinedu Hardy Nwadike was born to Mr & Mrs Bernard Nwadike of Ndiokoro Arondizuogu in Okigwe Local Government Area of Imo State Nigeria. He lived most his life in Irete, Owerri West Local Government Area of Imo State where he was born and raised by his parents. Losing his mother to cancer at the age of 9, Hardy and his siblings grew up with their father, Mr Bernard Nwadike, learning almost everything they knew from the man. Growing up was easy for him, in a normal Nigerian neigbourhood with people from different tribes of the country, he learned to tolerate everyone, as well as living without class. With his neigbourhood partly rough and football the only known sport, Hardy will have to fight with other kids at times to keeping standing and those were the beginning of the story of young man who would be making his mark as a singer, author, blogger, graphics & web designer, Industrial Chemist, inspirational speaker amongst others. He attended T.T.C. practicing school Irete, Owerri West Local Government Area of Imo State from 1988 to 1994 and then proceeded to Community Secondary School Orogwe, a neigbouring village in the same Local Government area where he finished in the year 2000. After delays with JAMB, he moved on to Madonna University Okija, Anambra State in 2003, finishing in 2007 with B.Sc. in Industrial Chemistry. Although he made plans of furthering his education to the highest level, no step has been taken on that so far. He was never known as someone who could write until his final year [SS3] in Secondary School where he started with poetry and short stories. His interest improved and between 2001 and 2003, he has entered for several online poetry and play competitions including BBC Africa and International play writing competition. He went on to develop with his love for computers and it changed his life after graduation as he went ahead to take a self tutorial to learn web designing and social media marketing. He later worked with Nigeria Newspoint Newspapers in Owerri, Imo State as a graphic designer, entertainment columnist and website administrator. 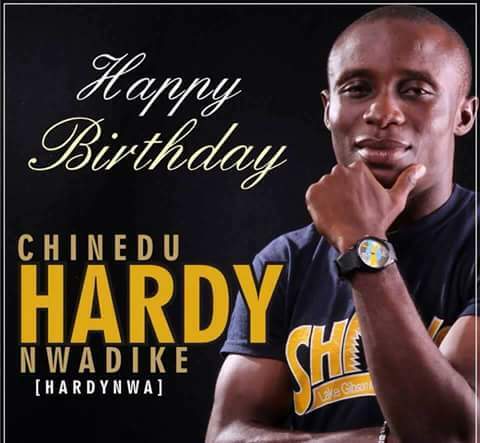 In May, 2012, Chinedu Hardy Nwadike launched a news entertainment website which is today, one of the leading local content driven weblogs in South-East and South-South Nigeria with its root in Owerri, the capital city of Imo State. The website was never an easy task for the Industrial Chemist turned Entertainment reporter; people advised him to stay away from Owerri because there was nothing happening there. Not heeding to their advice, he continued to push his project as well as urging entertainment columnists in Imo State based newspapers and tabloid to always pick stories from his website, to encouraged the homegrown artistes whom many had previously considered as misfits for the entertainment columns of newspapers. All thanks to hardwork and perseverance, Hardy’s Otown Gist can today, be reckoned with Kisha’s Amibo Island, IfeanyiCy blog and many more….Happy Birthday to him!! !